TUESDAY TOPIC SEMINAR COMING FEBRUARY 2019! Tuesday Topics are seminars presented by the Chamber's BEST Committee (Business & Entrepreneur Support Team - formerly the Small Business Resource and Development Committee). They are open to Chamber and non-Chamber members. Registration fee varies per seminar. Check out the Chamber's Calendar of Events for upcoming Tuesday Topics! Ryan Barker, director of Health Policy for the Missouri Foundation for Health was the guest speaker during the Tuesday Topic seminar - Understanding Health Care Reform. 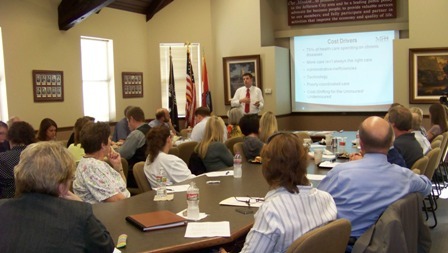 Over 40 small business owners and individuals came to the Chamber to hear additional information and have a better understanding of the health care reform. Barker told the group this was the 115th presentation given from all of the state since May 2010, shortly after President Obama signed the national Affordable Care Act into law. The Missouri Foundation for Heath is planning to host workshops on this topic at a later date. The Chamber plans to collaborator with the foundation in promoting these workshops. For further information or to contact the Missouri Foundation for Health, go to: www.mffh.org. 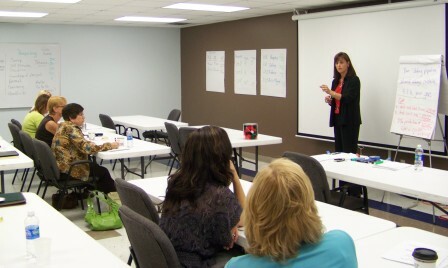 Cathy Atkins, Sandler Training, presented 25 Ways to Mine for New Business in the Current Economy. Cathy donated all proceeds from the seminar to the Energy Assistance Program which assists low-income households in Central Missouri in maintaining utility services. This program is overseen by the United Way of Central Missouri and administered by the Salvation Army. Thank you William Woods University Graduate & Outreach Studies for hosting the September Tuesday Topic.